Trying to find a way to present a problem – cause relation creatively? 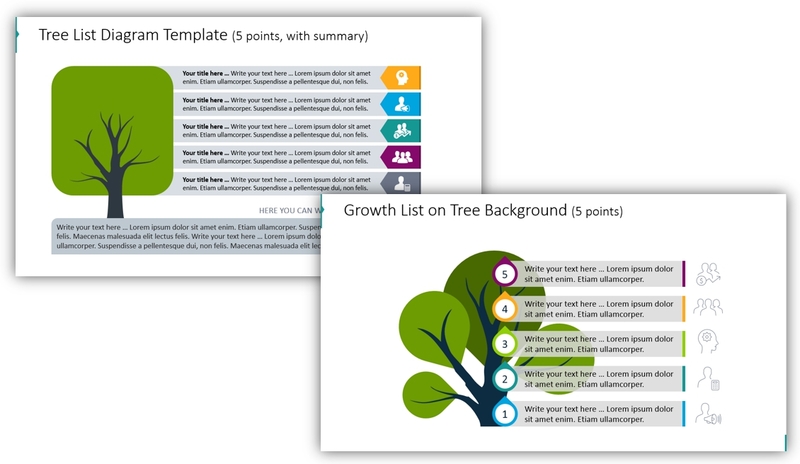 Visual tree diagrams are suitable illustrations for showing a problem root cause analysis, as well as various branching charts and hierarchies. 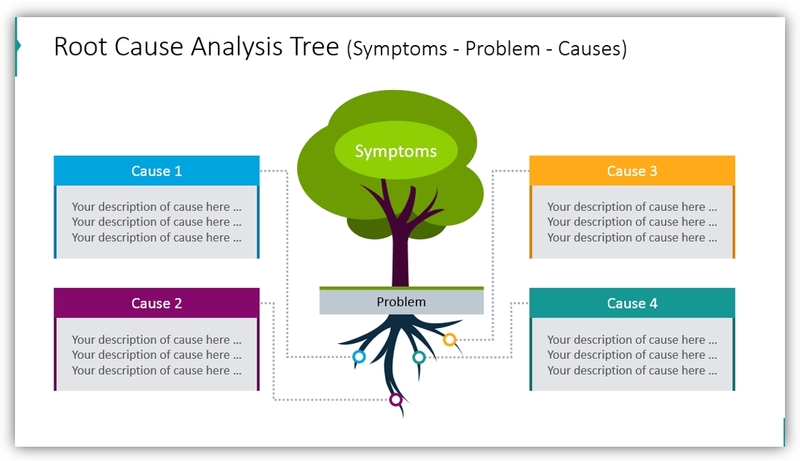 A tree diagram is a visualization tool for presenting problem-solving by root cause analysis of symptoms (visible as tree branches and underlying causes – hidden in the tree root). You can also use the tree branches image for representing various branching structures and hierarchies e.g. classical organizational charts or family trees. You can get all slides from Tree Branch Diagram Root Cause PPT Template (see details by clicking the pictures). 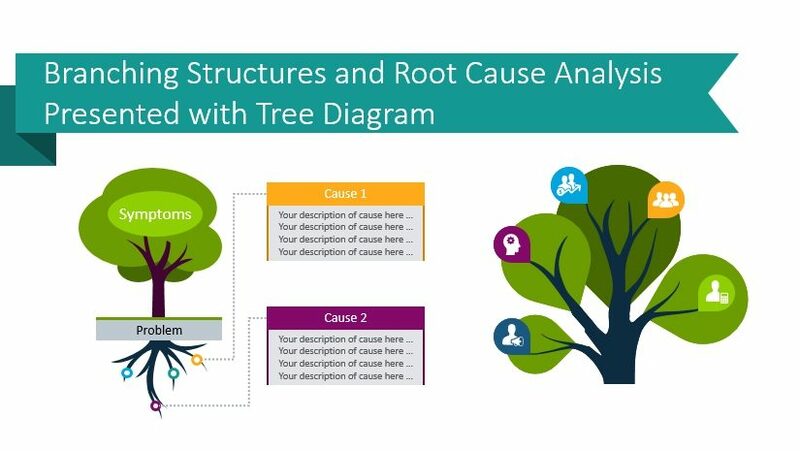 Why use a tree diagram to show root cause analysis? Tree Branch diagram helps to present a business decision process, illustrate a procedure or show the decision logic. Bottom-up or top-botom way, depending what order of explanation you will choose. 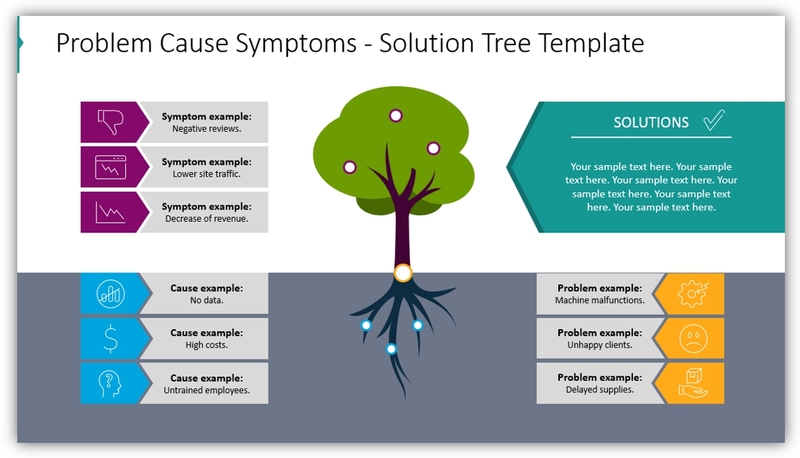 Root Cause tree template will serve you for illustrating symptoms, problems and causes in a creative way. Tree shapes help catch the attention of your listeners and avoid clutter on the slide. You can see several version of tree diagram we designed – with less and more space for text, with and without icons, with call-out boxes for adding explanations if needed. You can easily edit all of them by duplicating or removing items. Why use a tree metaphor? Generally, a tree is a great metaphor for showing top-down or bottom-up concepts, as well as hidden (root) and visible parts (tree branches) of the problem analysis. Branches themselves are a good representation of any hierarchy-based structures. You can play around the tree on a slide as you want. For example, you can use such a variation if you want to state the points briefly and add a summary. 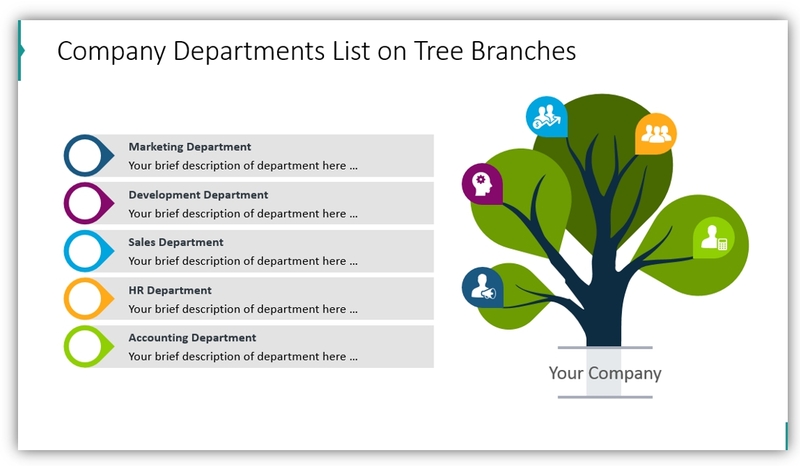 To present such a common corporate topic on organizational hierarchy structures, we used a tree with branches, which symbolize departments by icons. On the left, we added five points which correspond with icon colors, for a short description of each department. As we mentioned, a tree can be used while talking about a problem root cause analysis. This slide is an example of such a concept: symptoms are presented above on the right, causes are below, following by problem examples. A logical final is in the right part of a slide, highlighted with a header and color. If you need to explain a complex root-cause analysis or problem-solving process, this slide template will be handy for you. If you are looking for different type of diagrams, check out our infographics bundle which includes 200+ creative PowerPoint diagrams, including timelines, lists and comparisons.